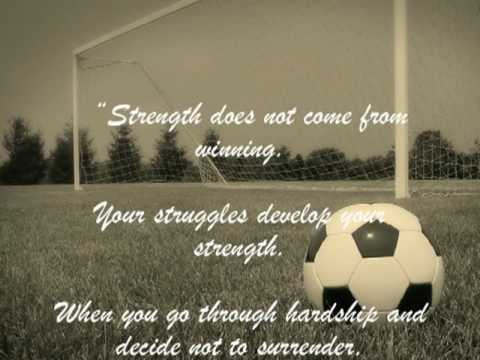 It was during one of our games, I was in goal and my team was up by a few goals if I remember correctly. Sometimes it is hard to keep complete focus when you do not get much action in goal. It was a corner kick from the opposing team, it came into my area and I went out to catch it in the air. It was not a very hard kick, I misjudged it a bit and caught it against the side of my face and then brought it into my hands. It hurt a little bit but I was fine and kept playing, finishing out the rest of the game. Then came the headaches, I didn’t think anything of it because I thought, “oh that barely hit me and hardly hurt, it’s just a little knock to the head.” I practiced the next day and the next 3 days after the hit, the headaches were getting worse. A friend suggested that I go see the athletic trainer and that I may have a concussion. I refused to go see him, I believed that I just had some small headaches and he would take me out when I didn’t need to be sat out. I was forced to go see him and got checked out, I was taken out, just as a precautionary. Then it got worse, my symptoms got worse, now experiencing nausea and increased headaches. I went to the emergency room at a local hospital where they did either a MRI or CAT scan, I don’t remember exactly. Everything came out fine, the hospital gave me medication for my headaches and nausea and I went back to my dorm. This was on Friday September 24, 2010; my mom came up to see my game that Saturday September 25, 2010, when I told her that I was not playing because of a suspected concussion. I ended up having to go home that Monday September 27, 2010 because my symptoms were not getting better and I missed class because of them and for being so fatigued. I was brought home to see my doctor, he evaluated me and suggested I go see a neurologist just to be completely checked out. I was suffering from fatigue, headaches, nausea, and found out I had a slight hearing loss in one of my ears. My neurologist diagnosed me with a mild concussion and said I was out indefinitely. I had to take a week off of going to classes, but I went back up to school to be around my friends for support as I went through this. In the next few weeks, I was diagnosed with post concussion syndrome which is defined as “complex disorder in which a variable combination of post-concussion symptoms — such as headaches and dizziness — last for weeks and sometimes months after the injury that caused the concussion” according to the CDC. For the next nine months I experienced headaches every day, almost all day long. The thing about them were that they weren’t just a small headache, they were severe all day long headaches. I could not do any physical activity for about 90% of that time. To talk about my symptoms, most of all it was headaches, but what else could they be? What other symptoms could there possibly be you may think? I was nauseous almost every day for the first three or four months, thank God that finally went away. I was always tired; I experienced a great deal of fatigue, but could never sleep. So as you may have guessed, I could never get over the tiredness. I sometimes could take naps during the day at like 4:00-6:00pm, always with an ice pack on my head or behind my neck. I went to bed every night for nine months with that ice pack under my head or on my forehead. I had a lot of memory issues, one of the times when it was the worst was when I spoke on the phone with my mom and couldn’t remember at all what I just talked to her about at all. What that contributed to was that I felt myself having to work 200 times harder in school. Trying to study was the worst, spending a lot of time writing a paper on the computer or studying a book gave me the worst headaches. I contemplated leaving college, taking the other half of the semester off so that I could get these headaches and other symptoms under control, but I decided to stick it out. I had a little bit of balance problems, but it wasn’t that much of a symptom as the others. One of the scariest moments was when my neurologist prescribed me a steroid pack to try because we were trying out many medications to get something to work. I got the steroid pack in the afternoon one day and took the pills that it said to take that night before bed. I woke up the next morning and took a shower, went into my room and fell over. I couldn’t stand up straight and walk; I just kept falling to the sides. My neurologist figured that I was having an allergic reaction to the steroid and I had to go home to be watched 24 hours a day. I was on many medications during these months, probably fifteen or more different medications. At one time, I was taking twelve pills a day, a few in the morning but most at night. The medications were for all of my different symptoms. One of my medications made my feet and hands tingle to the point where it was unbearable. My neurologist told me that orange juice made the tingling go away, so basically I drank like 2 containers of orange juice every week. I was taking sleeping pills that could have side effects of hallucinations, which of course I had when I would wake up at night. My neurologist and I were trying all kinds of medications; with stopping ones that weren’t working I had to deal with rebounding. When you rebound off a medication that you have been on for a while, your symptoms get worse and you feel sick. With going through this for so long, I believe I became slightly depressed because these headaches mess with your mind and you don’t think they will ever end. I thought I was going to be like that for the rest of my life. I had some nights where I would pray that either the headaches were gone in the morning or that I wouldn’t wake up. I finally got through this hell; I believe that I was finally 95% headache free by the middle of June. That is when I started to come off most of my medication; I can’t remember the exact day when I came off of all of it. I decided to go back to playing soccer in the fall of 2011, with headgear to protect my head from another concussion. I felt myself not having as quick of a reaction time in-goal; just not as good as I used to be as a keeper and I did not play much that season. September 22, 2011 came around; I was warming up in goal, receiving shots from my teammates, when it happened. My teammate took a shot on goal; it hit the side post, came back and hit me on the side of my head. I went down in pain and disbelief, and slowly walked off to the sideline. I knew it right as it hit me, concussion number two. I became very fatigued and slow thinking, I was diagnosed with a concussion. I then went back on some medication and began to see a doctor up by my school, while seeing my neurologist back home whenever I was home. I experienced a lot more memory problems and I had very bad balance. I began taking ImPACT tests, which stands for Immediate Post-Concussion Assessment, and Cognitive Testing. The test is a computerized concussion evaluation system. I started off doing horrible on these tests and almost always came out of them slow thinking, with a bad headache and completely exhausted. What these tests told me was that I was having memory problems basically. I took them for a few months and they got a bit better by the time I stopped. I stopped because I was just tired of taking them. My balance got a little better, I am still experiencing some difficulty on balance tests, and I usually fail at least one. This time around I dealt with the concussion better, I knew how to make the headaches decrease. The first concussion made me a stronger person, so even though I had another concussion it didn’t bring me down as much as the first one did. I was on medication for the first few months but I made the decision to come off of all the medications, because I felt they were making me more forgetful and slow thinking. This concussion lasted around 9 months also but I finally got through it. I can tell you concussions are hell, I learned so much from going through them though. I learned how serious they are, they are by far the most important thing that you do not want to think light about. Take time if you get hit to sit out, it is not the end of the world to sit out for a few days or so. If you keep playing you could risk second-impact syndrome, which is when you get another concussion too soon to the first one, this could be fatal. My neurologist and I figured out that I have probably had at least four very mild concussions before these two but never thought about it. So it is determined that I have had six concussions in my life. The hardest but easiest decision I have ever made was to never play on a competitive sports team again. My sports career is over, it was hard to deal with but I can’t risk my health, which is most important. Where am I now? I am in my junior year of college, now at a four-year college. In my two years at my community college, despite what I went through, I managed to get on the dean’s list both semesters my freshmen year and I was on the president’s list both semesters of my sophomore year. I still get headaches at least once a week, my balance is better, I have a slight memory problem and I am not on any medication. I am a stronger person, having gone through this. If you are someone who is going through a concussion or post-concussion syndrome, “keep on, keeping on”. You may think you will never get through this, but you will. It may be hell but keep going. It is like a waiting game, but be strong a wait it out. If you are a parent, protect your child. You may think that they can tough it out but don’t let them. They may tell you not to worry, that they are fine, DON’T BELIEVE THEM. If your child gets hit, keep a close eye on them and know what to watch for. Take them to a doctor to be evaluated, just to be safe. Protect them. If you are a coach, protect your players. Don’t let them tell you they are fine, just because they want to play and you want them to play. It is not worth it! Trust me, it’s better to take care of it now, than to lose them for the rest of their seasons. My name is Rachel Abrams; September 22 will forever be a horrible day for me. What I want to do is educate people and support people who may be going through something like this. There is no reason that concussions should be put on the back burner. Rachel, I can sympathize with you. My granddaughter had a very bad concussiion and is still feeling the effects. But life goes on, doesn’t it?. Thank you for publishing Your story. I was diagnosed ith my fifth concussion in the latter part of September. I am having a difficult time with recovery this go round. Thank You for the assurances that it does eventually end. I’m 15 and suffering from what may have been my third (or only my second) concussion. Although I didn’t have post-concussion syndrome during the first two, the third has impacted me severely, and I have had headaches, dizziness, nausea, neck pain, ringing ears, memory problems (i dont remember anything for more than a month before) and slightly strained/blurred vision for 15 months now… All because I was diagnosed incorrectly at the start and didn’t take any time off to recover. I just wanted to say that I really appreciate reading something by another person who has had concussions, and being able to relate to your story. Thank you for sharing this with the world. family, coaches, and friends don’t ever understand what it is truly like, and people need to know that concussions should be properly treated, and avoided as much as possible. Thank you thank you thank you Rachel! For the past five days I have seen two different doctors who can not pin point what is going on. I, all of a sudden experienced this wall of fatigue, then came dizziness then came the headaches. It has recently come in waves. I have a 13-month old son who needs about 24/7 attention because he’s so intrigued with the world around him and wants to discover on his own. So yesterday when I couldn’t play with him and had to sit it out, because I was exhausted I thought I was losing my mind. I went to an urgent care facility who sent me home and told me to take Tylenol. Nothing was conclusive. Last night I woke up so dizzy I couldn’t even open my eyes, I was so out of touch and out of control of my own body. Then this morning it hit me! A few weeks ago I took a major fall and him the side of my head where I am now experiencing my headaches! I googled conclusions and this was second on the list! Thank you! I would like to have your email if possible, because I want to make sure I’ll be ok. I’m so scared! I fell off a moving golf cart while standing on the back. It was early in the morning and the bar I was holding on to was wet with morning dew. The next thing I remember, I was rolling on the ground and my head hurt. I was very worried because I had a hysterectomy a month prior and was worried because I wasn’t totally recovered. I stayed to watch my son’s first game but then went home to rest. I was very sore on both sides of my neck, my shoulder, elbow and hip. After, three days I went to the doctor. He was most concerned with my head injury and suspected I suffered a mild concussion. Ironically, my abdominal area was not sore. I suspect I was so stiff while falling that I rolled in order to protect my recent hysterectomy surgery. It has been exactly a week and I am still having headaches. Going over bumps on the road hurts my head. Could that make healing slower? My body soreness had mostly healed up but my headaches continue. I am hoping this ends soon. The only time I have relief is when I am asleep or enjoying a glass of wine at the end of the day. Has anyone had a similar experience? I am 49 years old so maybe healing takes a little longer. How much should I restrict my activity in the next few weeks. Bed rest or is it okay to run errands or take a walk? It has been a difficult summer. Thank you for sharing your story – it is truly inspirational for those of us who are going through something similar. Wishing you much health and happiness. Excellent article. I am going through Post Concussive Syndrome, and it is as you said, “Hell.” You have to learn what can trigger the dizziness, the nausea, etc. It is a fight to get your health back. I hope that your health continues to improve. Please take care. My son Colton got a concussion from body surfing in August. He was out of school for 4 months and took classes on line beginning in November. He takes medication everynight before bedtime. The headaches were gone for weeks we thought they were over. He went camping one weekend in Joshua Tree National Park just one night. The head aches came back and were gone again. Then his boy scout troop went shooting on a Sunday. He went immediately to wait in the car far away from the range because the headaches came back again. 4 days out of school that week. He was fine Friday and Saturday. On Sunday he went hiking at Griffith Park with the scouts. His headaches came back again. We’re on month 7 of post concussive syndrome. It’s changed me. It’s changed my son. I’ve learned to be patient and protective with his recovery. Before this he was “Captain America.” He played 3 sports baseball, basketball, and some soccer. He sailed often, and was very active with his boy scout troop. Now everything is on hold. Thank you so much for this Rachel! I’m 14 and currently experiencing something similar to what you were. This is only my first concussion and technically right now I am experiencing post traumatic brain injury for the ninth month and counting. I hit my head in January, which we immediately got checked out and diagnosed as a concussion. However, the symptoms persisted for the next month so I saw the Concussion Clinic followed by a neurologist. During this time frame and basically until the end of the season I wasn’t allowed to go back to swimming on my team, which made me depressed and upset. After trial and error with my neorologist over the next few months, I was put on 3 different medications, and I was eventually allowed to return to the summer swim season. Unfortunately, my concussion causes severe headaches, so I had to sit out for parts of practice when I got headaches because exercise just made it worse. As of right now, I’m seeing a pain pyscologist as well as my neurologist, and I’ve lost significant weight due to one of my medications. Bearing through this is so hard, but hearing your story makes me so happy that someone has overcome what’s been put before them! Thanks so much for your story! I was in a car accident with a concussion. I was in the hospital for a couple days but they dismissed me with Tylenol. I had a headache then, and still have it three weeks later. Nothing helps. My bruises are just about healed, but the aches and headaches remain. I’m also wanting to sleep away much of my day. I have never been this tired ever. Thanks for writing about all of this so I know I’m not alone with this problem.